"Tomatoes and basil together are a sure hit! Very flavorful. For cheese lovers, try a stronger Brie cheese, otherwise a medium blend will do. Great served warm or cold." Just tried this again the other night and this time i sautee'd some huge tiger prawns and added that also....holy cow...luv it.. Awesome. I'll likely roast or saute the garlic next time. It was a bit strong. 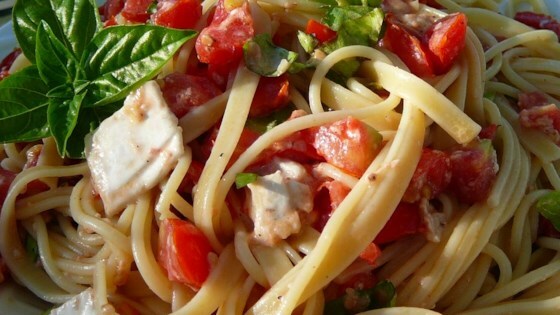 Great summer dish to use basil and tomatoes from the garden.